Despite being a fairly new magazine, Vogue Arabia seems to have massive pull when it comes to cover subjects. In 2018 alone, it has featured Irina Shayk, Iman and Imaan Hammam, Adwoa Aboah and Ashley Graham and Paloma Elesser on the front cover, while also managing to secure HRH Princess Hayfa Bint Abdullah Al Saud. For its all-important September edition, the publication was the first to make Nicki Minaj a Vogue cover girl and now, Naomi Campbell makes her debut on the magazine’s signature twin covers for November 2018. Photographed in Chris Colls’ studio, the ultimate 90s super wears bold Balenciaga and Tom Ford looks styled by Jenke Ahmed Tailly. According to our forum members, the two covers felt like a missed opportunity. “Terrible! Styling, pose, everything. This is not a cover. The styling is just too much for me. They couldn’t tone it down a bit?” asked Benn98. “This reminds me of what Vogue Portugal once was — tragic reprints of editorial shots from US Vogue. This seriously looks like a REPRINT from a US Vogue editorial. Shame,” said MON. “It looks a bit fan made to me, and that’s more of an editorial opening shot than a cover. I really don’t think I like it,” said dodencebt. “This is awful and this is not Arabian,” Srdjan pointed out. However, not everyone was disappointed. “I love it! It’s IN-YOUR-FACE-BOLD, fun and it definitely caught my eye. The styling is over the top but she made it work. 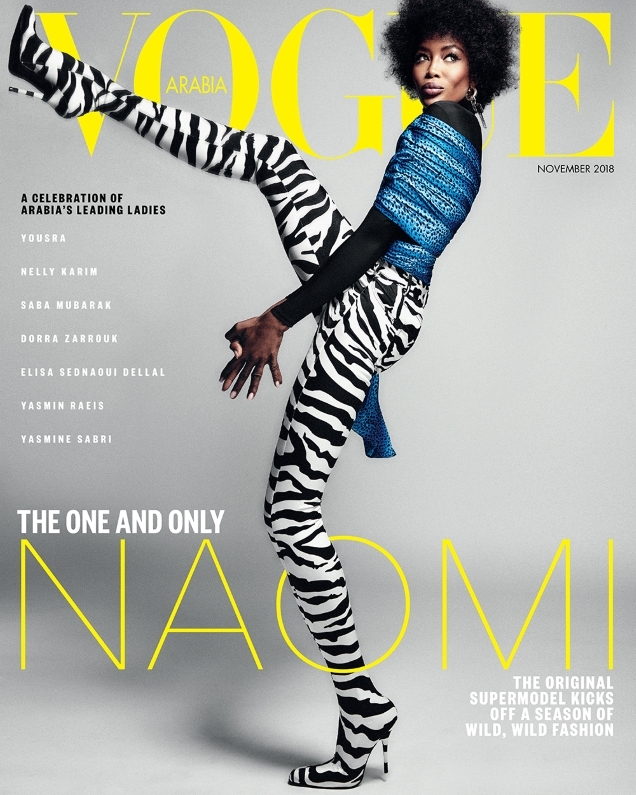 I love me some Naomi Vogue cover anytime,” raved Bertrando3. “I can’t help and like it, it’s fun! How often is she portrayed like this, these days?” asked Miss Dalloway. Are you feeling Naomi’s latest? Await more from the cover shoot and be sure to join the conversation here.